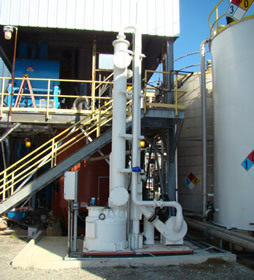 Fume Scrubbers are designed to remove contaminants from an air stream by using intimate contact between the airstream and a liquid “scrubbing” solution. 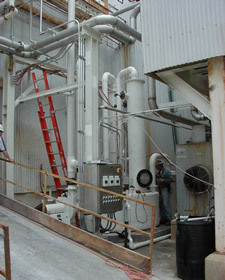 The airstream enters the scrubber near the bottom and progresses up, counter-currently, through a “packed bed” and is discharged through the top of the scrubber. Scrubbing liquid is distributed across the top of the packed bed section by either a spray or a distribution trough assembly. 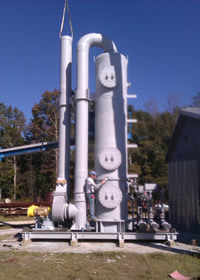 A demister is installed near the top of the scrubber, to remove as much of the liquid from the airstream as possible prior to discharge into the atmosphere. Common Fume Scrubbers are Hydrogen Sulfide Scrubber, Hydrogen Chloride Scrubber, Hydrogen Fluoride Scrubber, Sulfur Dioxide Scrubber, and Sulfur Trioxide Scrubber.